Sotheby's Arts of the Islamic World sale on 1 May presents a wide variety of pieces produced over 1,200 years and spanning several continents, from precious gem-set and enamelled jewels from India, to an important private collection of arms and armour. Click above to see more. A rare and important Iznik 'Golden Horn' pottery dish, Turkey, circa 1530. Estimate £300,000–500,000. 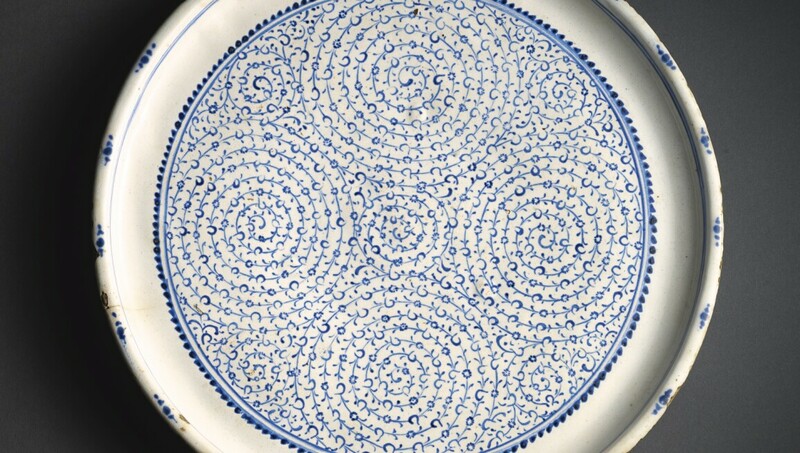 This is a rare intact example of Iznik pottery of the 'Golden Horn', or 'Tuğrakeş’, style. Last sold in these rooms over thirty years ago, it represents an opportunity to acquire one of the last examples of ‘Golden Horn’ Iznik remaining in private hands. A portrait of Suleyman the Magnificent, by a follower of Gentile Bellini, Italy, probably Venice, circa 1520. Estimate £250,00- 350,000. This painting is of both historical and art-historical importance; not only is it one of the few Western images of an Eastern potentate done by a European artist, but it probably also served as a primary source of inspiration for many later portraits, drawings, prints and medals of Sultan Suleyman the Magnificent. An important gem-set and enamelled turban ornament (sarpech), India, probably Deccan, 19th century. Estimate £120,000–180,000. Only the Mughal emperor was permitted to wear a royal turban ornament (sarpech). They were considered as marks of honour, worn by the emperor and ceremonially presented on important occasions This impressive sarpech, finely enamelled on the reverse, comes from the family Hari Singh Nalwa (1791-1837) and it is an example of the splendours of the Indian courts in the 19th century. A large illuminated Qur'an, Persia, probably Shiraz, Safavid, second half 16th century. Estimate £80,000–120,000. This impressive Qur'an has all the hallmarks of the most refined manuscripts of the Safavid period, and is noteworthy for several reasons, including the lavishness of the illuminations as well as the controlled and balanced hand. It stands as a testament to the artistic achievements of the Safavid manuscript tradition in the 16th century. A Timurid cut mosaic tile panel, Central Asia, late 14th/early 15th century. Estimate £60,000–80,000. Mosaic cut tile panels such as the present example appear rarely on the market. The current piece was acquired directly from the estate of Henry-René d'Allemagne and it is a testament to the sophisticated techniques developed by the Timurids, who utilised pieces of cut-tiles joined with plaster to form complex multi-coloured mosaic panels. Probably a previously unknown illustration from the ‘British Library/Chester Beatty’ Akbarnama: a battle outside a walled fortress, attributed to Sur Das, India, Mughal, circa 1602-03. Estimate £60,000–80,000. This finely executed Mughal painting shows a captured commander brought before a ruler or general on horseback as a battle rages outside a walled fortress. It is painted in a style associated with the final few years of the reign of Emperor Akbar, circa 1600-05, and was probably part of an Akbarnama, the other paintings of which are now in the British Library, London and Chester Beatty Library, Dublin. A large Mamluk silver and niello-inlaid brass candlestick, Egypt, 14th century. Estimate £40,000–60,000. Candlesticks of this design and quality were largely produced in the first half of the 14th century and their splendour reflected their role as an important part in Mamluk ceremony. The inscription on this candlestick affirms that it was intended for a member of the court of the Sultan al-Nasir Muhammad (1293 -1341 AD). A turquoise-set sword (kilij) and scabbard, France or Russia, 19th century. Estimate £40,000–60,000. This sword belongs to a rare and important group of swords, each characterised by their profuse use of cut turquoise in combination with an elegant design of split palmettes or arabesques in gilt and niello that can be traced back to the same workshop with outlets both in Paris and St Petersburg. A fine Ottoman ivory and mother-of-pearl mounted miquelet rifle, Turkey, 18th century. Estimate £35,0000–45,000. This impressive miquelet rifle is inlaid with ivory, mother of pearl and coral, and shows the lavishness of the Ottoman court in the 18th century. A rare miniature Qur’an on vellum, North Africa, Near East or Persia, 10th century AD. Estimate £70,000–90,000. Miniature Qur’ans on vellum from the 10th century are rare and generally attributed to Persia or Mesopotamia. This small volume doesn’t have a colophon, but the 'New Style' script which characterises this Qur’an became popular and used across the Mediterranean as well as in Central Asia. Abu Muhammad al-Qasim ibn Ali Muhammad ibn Uthman al-Hariri (d.1122 AD), also known as al-Hariri al-Basrahm, Al-Maqamat, Near East, late Abbasid/early Mamluk, 13th century AD. Estimate £40,000–60,000. The Maqamat by al-Hariri is one of the most important texts of Arabic literature and probably comparable to Boccaccio’s Decameron or Chaucer’s Canterbury Tales. It’s a collection of fifty tales and is a testament to the linguistic variety and finesse of the Arabic language. A large Ottoman talismanic shirt (jama) with extracts from the Qur'an and prayers, Turkey, 16th/17th century. Estimate £50,000–70,000. Ottoman talismanic shirts dated to the 16th and 17th century are incredibly rare, especially in such fine condition. This example shows a large variety of invocations, stylistic scripts and an inventive design of roundels throughout. An illustration of Krishna in his cosmic form, India, Nathdwara, 18th century. Estimate £12,000–18,000. The Indian god Krishna is depicted here as a cosmic form of Vishnu. The figure is encircled by smaller scenes, creating a narrative and showing the god as the centre of the world.